If anyone asks for a reading this is my go to predictive method, I have predicted a marriages, a layoff, a move, a cheating scandal, heartbreak, and a termination. I love Solar Returns and will post them as a tool so you can read your own and see what is up ahead for you. My Solar year is ending soon; so I thought this would be a great time to post some of my revelations. The Sun is your focus of the entire year; for me my Sun was in the 11th house the house of hopes, dreams, plans and oddly astrology. Falling into the natal 4th house of real estate. The 11th house is an active house, it’s a year of planning going and doing. I started out the year having just purchased a home so a lot of planning goes into that; decorating , calling someone to put this up, calling another to fix that. I have also begun writing horoscopes, acting etc it was tiring (all the planning) but this in no way negated the happiness I felt. This was the best I have felt in awhile. This year is the best I have felt in several years. Perhaps that is because I have a Solar Return Rising in Leo. Now here is where I want to caution you; the solar return ascendant is in the natal 7th house, people often proclaim this is a marriage indicator, that combined with Venus conjunct Jupiter in the 10th (a house that often rules weddings& planets that rule love) is also a marriage indicator, I’m not married and my love life is as dead as Jimmy Hendrix, I don’t even get that occasional Elvis sighting, if you know what I mean. The solar return ascendant on the natal 7th house was a case of being attacked, that is how it manifested toward me. The 7th house rules open enemies and these enemies usually come in the form of employers and spouses or others we share a contract with. Several times I have felt attacked by my employer; they have been outright venomous towards me. 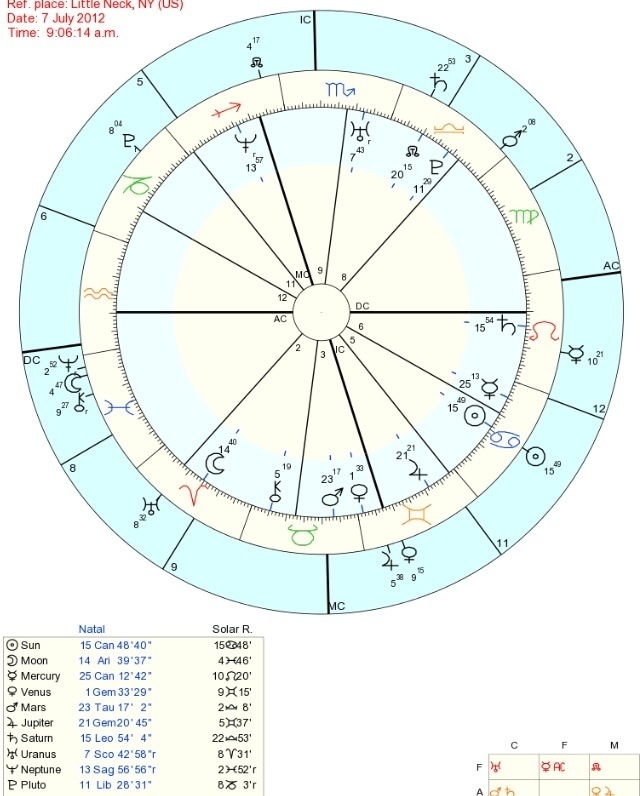 If you see the natal descendent has Neptune and the Moon in the 7th the placement of these 2 planets indicate fluctuations, emotional confusion, emotional ups and downs due to others. I held strong in the belief I would be ok and rise above the drama because Venus Conjunct Jupiter was in my 10th house of career. Neptune indicates confusion, Uranus indicates abrupt change and Pluto’s placement indicates obsessions, I have Pluto in the 5th house of recreation, love affairs, and children. This is often a placement in the year someone has a baby but for me it has come in the form of birthing new projects, writing, blogging, and acting. Recently I have toyed with the idea of playing piano. You can also look at the Solar return houses in the natal houses for instance I have the Solar Return 6th house falling into the natal 12th house. The 6th house is the house of work; the 12th house is the house of covert enemies, sorrow and confinement. Check Check Check I have worked for a company 8 years and this was the worst work year to date. A lot of worries, a lot of terrible things. You can actually see this 2 ways; the solar return 12th house is on the natal 6th house. You are supposed to look for several indicators before confirmation, I always look for 3. Mercury in the 12th falling into the 6th is a blatant indicator of a heavy mind (Mercury) and work concerns. Look at your Solar Return Chart to see what they year has in store for you. This year I have a 9th house stellium; travel, learning and joy coming right up! I have my next solar return sun in the 2nd house. The sun is conjunct Mars in the 1st. Does this indicate that I will have problems earning/making money? I hope not. Are there any positive meanings with this aspect?